The Circus Pages shows scheduled for Wednesday at the Delaware County Fairgrounds are canceled after Delaware City Council voted to table a resolution granting permission for the circus to operate. Council members said they didn’t have enough time to determine whether “the circus will in any way endanger or threaten the public peace, property, health, safety, or welfare of the city,” as it states in the council fact sheet. Prior to taking a vote, council heard testimony from Shelly Emans and Julie McDonough, members of the public who said they had gone to the Circus Pages show in Delaware last year and observed the whipping of a horse and dogs in cramped cages. “Circuses must change with the times,” Emans said, noting that circuses with animals were in decline, while the humans-only Cirque du Soleil now had 19 different shows. A petition initiated by Beth Keener requests City Council, Delaware County commissioners and the Fair Board to “ban any circus from coming into the county or the city of Delaware.” The petition has 1,076 signatures from people all over the world. Bill Lowe and Henry Thomson, representing the fairgrounds, said neither they nor their employees had seen any mistreatment or malnutrition of animals from the circus. 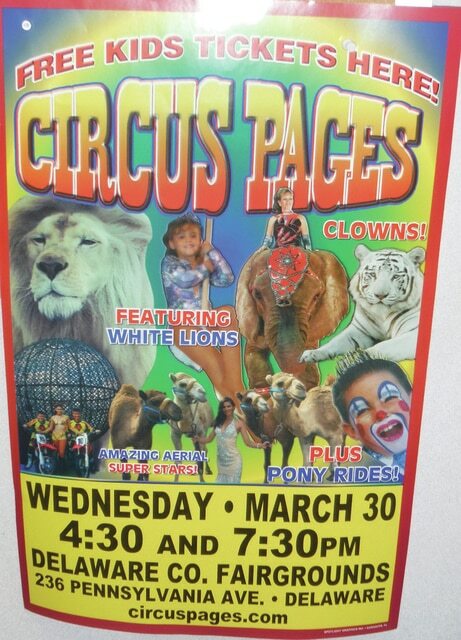 Lowe said Circus Pages has been at the fairgrounds for six years in a row. City officials said that in the past, Circus Pages has not received a license to operate from council, which is under section 737.01 of city code. Last week, the circus was contacted about requesting a permit. “Per a representative of the circus, the circus was unaware that it needed a permit,” states the council fact sheet. One member of council said he was surprised the circus, which has been in operation for decades, didn’t realize it needed a license. No one from Circus Pages was at the council meeting. Council members said the legislation needs updating, which it will take up at a future meeting.